What does the end of Unica NetInsight mean to you? IBM has announced it will no longer support Unica NetInsight, and the countdown to the end is underway. On 30 September 2017 the product will be discontinued. If you are a Unica NetInsight user it’s high time to start looking for a way out of this ugly situation. You know that you can’t afford to use outdated analytics software. Whether you’re deploying NetInsight On Premise or On Demand, you need to find a new home for your data. This is the spirit in which we’re developing Piwik PRO – as a reliable alternative for enterprises and organizations requiring full privacy compliance and data ownership. If you want to get ready ahead of time and meet the privacy requirements of today’s world, investigating Piwik PRO is a good idea. Like we said, privacy in web analytics is important. Piwik PRO is designed by default to do the things in the list above. Our guiding principle is to ensure total control and ownership of data remains in your hands. This is why Piwik PRO fully respects the Do Not Track setting, and also provides users with an opt-out iframe. Additionally, Piwik PRO can be set up to delete old visitor logs as a matter of course, providing yet another layer of privacy to your web analytics data. Not only do we pay attention to this serious privacy business, but we’ve also got a lot in common with Unica NetInsight that you should know about. A lot of the features you’ve come to know and love in Unica are also available in Piwik PRO. The Piwik PRO dashboard is highly customizable. You can add and remove widgets as you like, set date ranges, and display the exact analytics content you need to see. Here’s a blog post with more detail about customizing the Piwik PRO dashboard. Piwik PRO also offers Funnel Analytics, which allows for easy visualization of conversions to help you understand how users move through the sales funnel. Migrating from Unica NetInsight to Piwik PRO means you won’t lose the ability to follow click streams. This feature in Piwik PRO web analytics is called Click Path, and is particularly helpful in tracking the way users reach goals on e-commerce sites. Piwik PRO Analytics Campaign Reporting delivers information that helps you make the most of your marketing campaign spends. Track multiple dimensions and get conversion attribution for the complete picture of your campaigns’ effectiveness. Not only does Piwik PRO offer much of the functionality of Unica NetInsight, but there’s also a number of premium features from Piwik PRO that you can take advantage of to enhance your analytics experience after migration. White Label from Piwik PRO allows you to replace all mentions of Piwik PRO with your business name, as well as to use custom colors and fonts. Certified partners and resellers can also sell Piwik PRO under their own brand. You can also enhance enterprise productivity with SharePoint Analytics and Confluence Analytics integration in Piwik PRO. Take advantage of this powerful feature to improve teamwork across your organization and get the most out of your collaboration platform. User-Centric Reporting gives you the capacity to analyze user behavior at the individual level. By following the customer journey and cross-referencing with the power of segmentation you can pinpoint exactly what leads them to conversion. Alongside the features that you can take advantage of to enhance your web analytics experience with Piwik PRO, our team of engineers and project managers provides a broad range of support and consulting services. Custom SLAs, 24/7 monitoring and intervention, ongoing service and updates, and customized training are just a taste of what we can offer. You’re in a tough situation – sooner than you think, you’ll be left on your own with an unsupported analytics tool. And there are many different solutions to choose from. It’s natural that you’re going to consider your options. 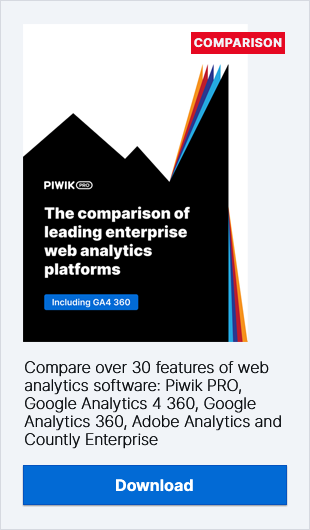 To help you make your decision, we’ve put together a detailed whitepaper comparing Piwik PRO with Google Analytics, the most commonly-used analytics solution. If you’d like to discuss your analytics options and set up a road map for migration from Unica NetInsight to Piwik PRO, get in touch with us and schedule a call with one of our consultants.